A black swarm above a fallow field, or they roost in the street trees, and in the groves of eucalyptus along the Metrolink tracks. Are they blackbirds, starlings or crows? 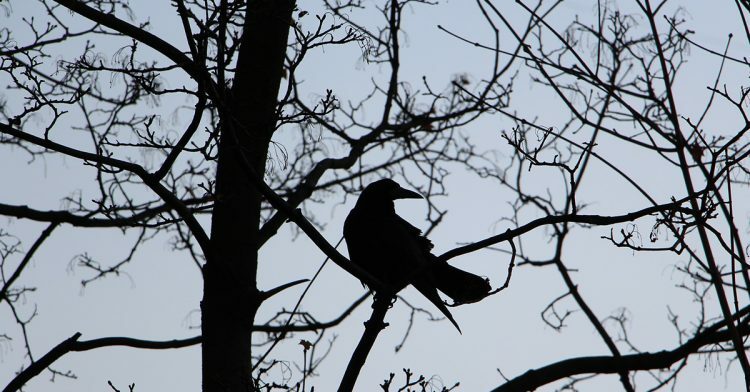 For three nights, our neighbors play Death Cry of a Crow to the trees and sky. How frightening, we say, waiting for the branches to empty. How righteous we’ll feel when the throng of birds takes flight, rowing through the air to new colonies. Lorene Delany-Ullman's book of prose poems, Camouflage for the Neighborhood (Firewheel Editions, 2012), was the winner of the 2011 Sentence Award. Her poetry and creative nonfiction can be found in Zócalo Public Square, Tupelo Quarterly, Santa Monica Review, TAB: The Journal of Poetry & Poetics, Prime Number, Lunch Ticket, AGNI 74 and Warscapes.